Offering you a complete choice of products which include global 7/5 cft concrete mixers machine, 7/5 cft four wheel type mixer machine, global 5/3 cft concrete mixers, 5/3 cft wheel type mixer machine, 5-3 cft mixer machine and portable type concrete mixer. 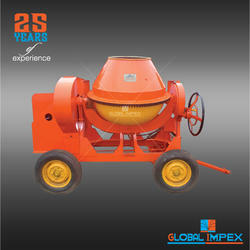 Our range of 5/3cft concrete mixer machine feature high impact strength, tensile strength and rugged construction. 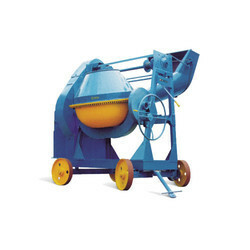 Its efficiency in mixing concrete and easy conveyance, the offered Concrete Mixer Machine is considered to be one of the best products in its league. Offered to clients at the best price possible, the offered product is highly preferred in the market. Sent for a number of quality checks, post the production process, the standard of the offered product is always maintained. The range has been designed and manufactured under the supervision of qualified engineers and technicians and exhibit the above features. 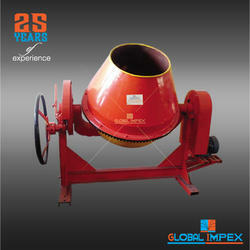 We hold expertise in manufacturing and exporting Global Concrete Mixer. Manufactured using supreme quality raw material, these machines are demanded for their attributes like longer functional life, corrosion-resistance and trouble-free performance. Further, they assure that these machines are in accordance with the global quality standards. Owing to the years of industrial experience, we have been able to serve our valued clients with a wide range of Global Concrete Mixer Stationary. These products are manufactured by our experts using premium quality raw material and progressive technology. Further, we check our products on different parameters before their final dispatch in order to make sure that these are in compliance with the global quality norms. Pan mixers are specially designed, study in construction and easy to mix Flyash, Lime, Gypsum, Cement, Sand and Coarse aggregates. The concrete mixed in pan mixer improves the quality and strength due to attrition exerted by the pressure of the CI rollers. 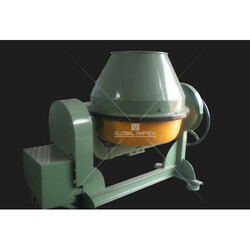 The quality of mixing is ensured by inner and outer scrappers and CI rollers. The roller pressure can be adjusted by compressed springs to suit different coarse & fine aggregate sizes. Best quality and tested raw materials are used and hence long life is ensured even at high working rate. 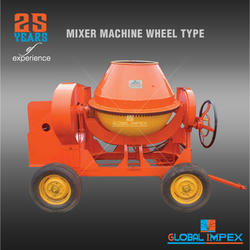 Pan mixer mixes concrete at very low water-cement ratio suitable for producing pavers, blocks, bricks and allied. Drive: Electric motor coupled to worm reduction gearbox through 'V' belts. Scrappers: the inner and outer scrappers are so designed that one brings the mix materials under the roller and the other takes out. The scrappers are braced with tungsten carbide tips or fully hardened special steel. Pan: Pan is protected with wear resisting replaceable bottom plates and the side walls within the zone of the scrappers are provided with renewable and adjustable. Rollers: Are made up of special casting fitted with anti-friction bearings and 'O' rings to last long. Loading of raw materials: Manual or by skip. Unloading of Mix: Bottom discharge through sliding door operated by rack & pinion manually or motorized. Discharge door motorized opening and automatic closing. Electronic weighing load cells for weigh batching of raw materials. 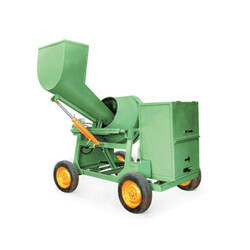 We offer a qualitative range of concrete mixing machines to our reputed clients from the construction industry. Our range of concrete mixers have the ability to take varying load of quantity of the component required to create concrete quality materials. 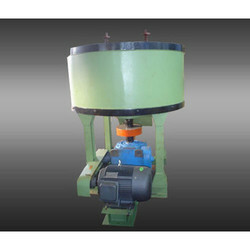 These machines have a sturdy structure and provide easy loading and unloading of the components. Our range is run by electric motor or diesel engine of 6 HP. 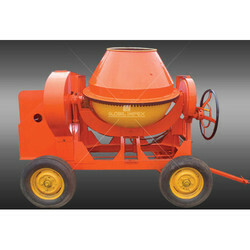 Looking for Concrete Mixer ?